Continuing with the cookbook of the month, here are some more of the recipes I’ve tried in March from Isa Does It. Creamy leek and potato soup is such a classic, it’s hard to go wrong. 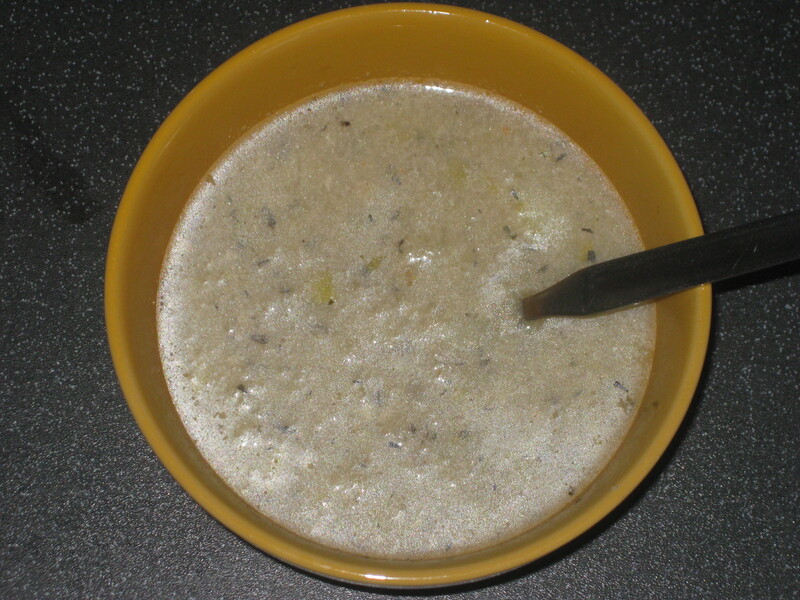 The picture here is terrible, but the soup is really simple and tasty. I used a hand blender to blitz about half of the soup, meaning the broth had a bit of thickness to it but there were still some nice little chunks of potato. 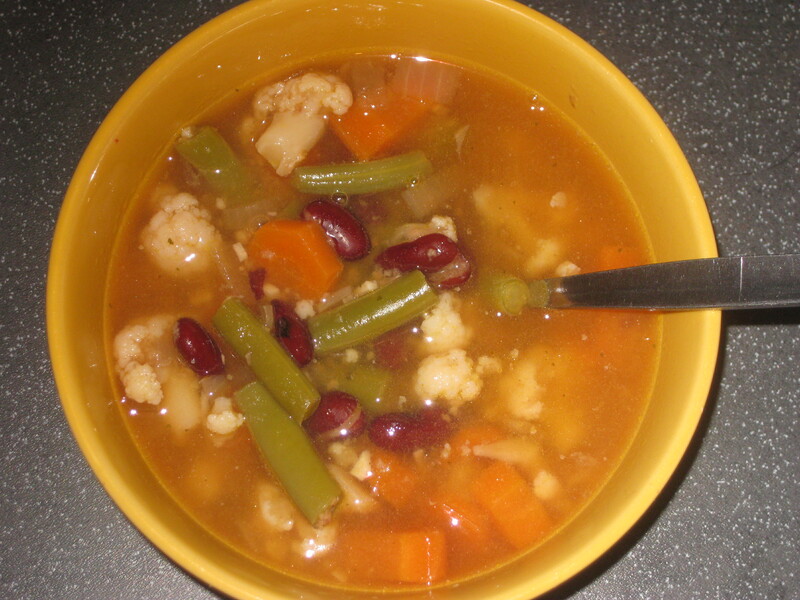 The chunky miso vegetable soup was not quite as good – the chunkiness of the title refers to the vegetables, rather than to the broth itself, which is very watery. It needs a partial blitz as well, I think, to thicken it up a bit. And I’d probably double the amount of miso to really pack a flavour punch. 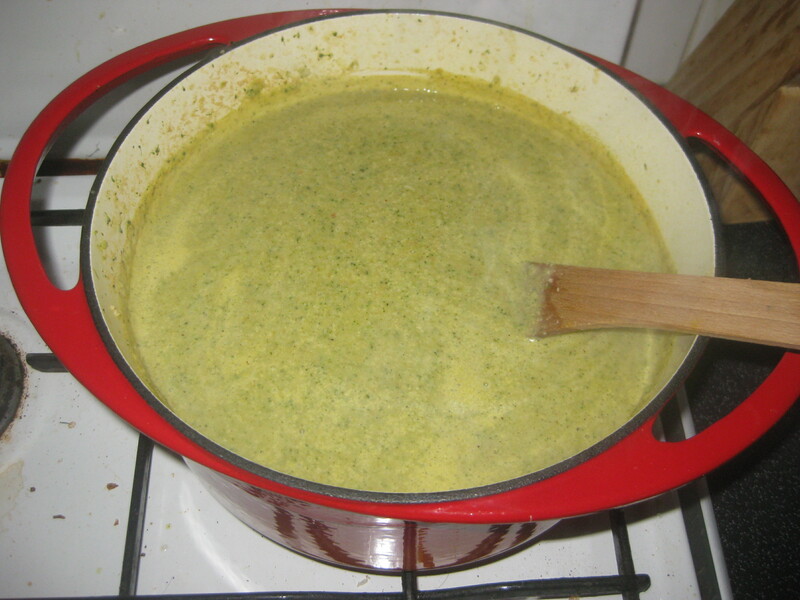 The cheddary broccoli soup was more enjoyable: it really does taste like a broccoli soup with cheese in it, almost unsettlingly so. The texture is unsurprisingly smooth and creamy, and broccoli soup remains one of my all time favourites. The wild rice soup with browned seitan was quite meaty (though meat-eaters might disagree), and really packed with flavour. 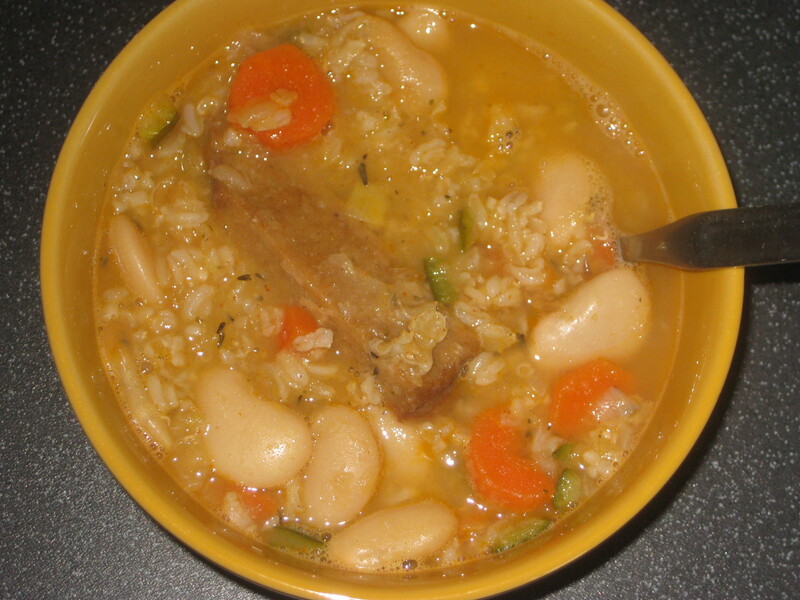 This is one that I’ll definitely make again, not least because I will take any opportunity to say “I love seitan.” I didn’t use wild rice, because I am not made of money – simple brown rice, with a courgette thrown in for colour. 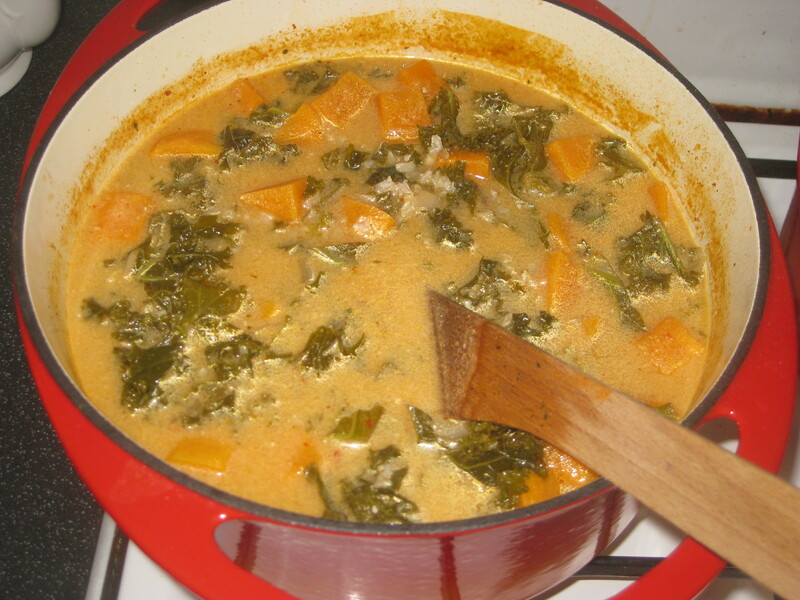 I was worried the sweet potato and red curry soup might have a bit too much going on: red curry paste, rice, sweet potato, kale, coconut milk. Fortunately, it’s a really well-balanced dish and a soup that’s definitely going to be on regular rotation in our house. It’s filling (unsurprising, with the rice), and just full of exotic Thai flavours, but it’s really simple and comforting at the same time. This is the king of the soups: new England glam chowder. It’s thick and tasty, and the crumbled nori sheets (never, ever try to chop nori. It’s a fool’s errand) lend a taste of the sea. 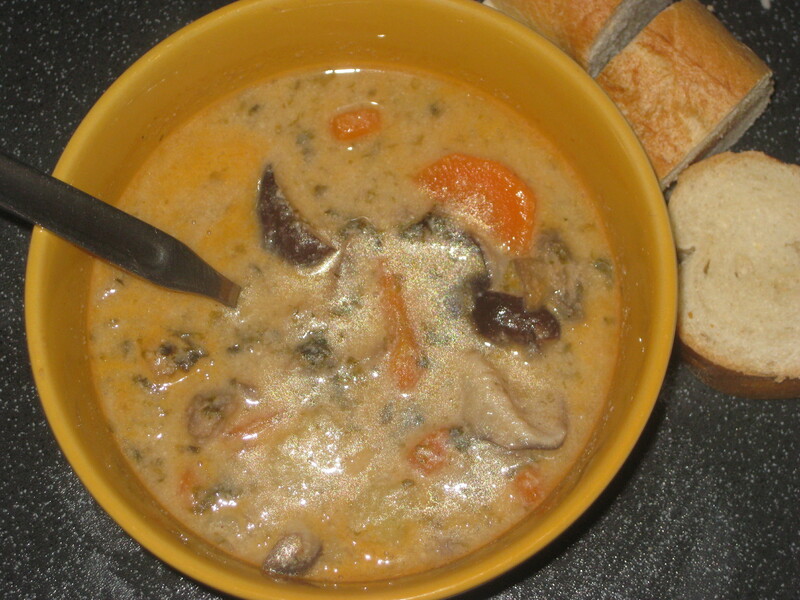 The shiitake mushrooms have such a great texture and meatiness, and there are chunks of carrot and potato in there too. It’s a substantial meal, and every part of it is delicious. I want to eat it every day. I far prefer soups to salads, but I did give the dragon noodle salad a go. 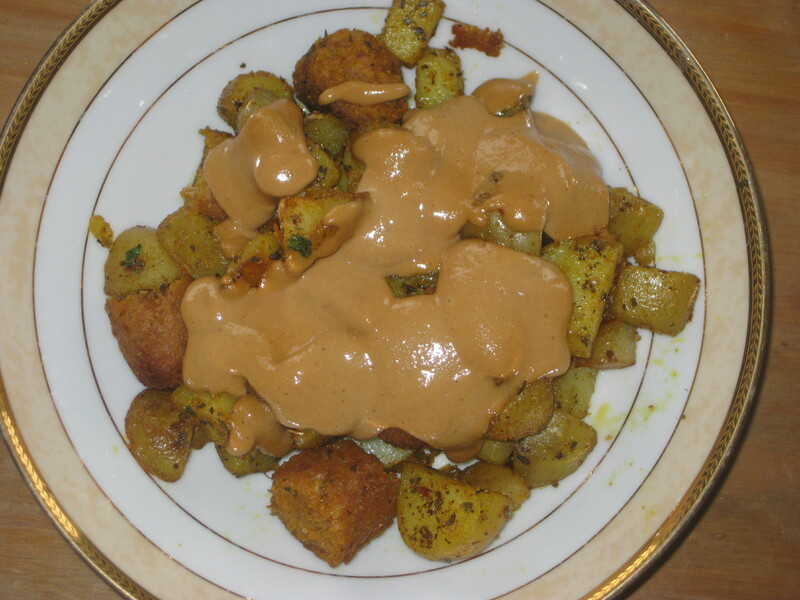 It’s very fast to prepare, and the sauce is so tasty, combining nut butter and sriracha beautifully. It even managed to make the abominable cucumber more bearable! Next time I think I’ll add some tofu to really make it into a well-balanced meal. 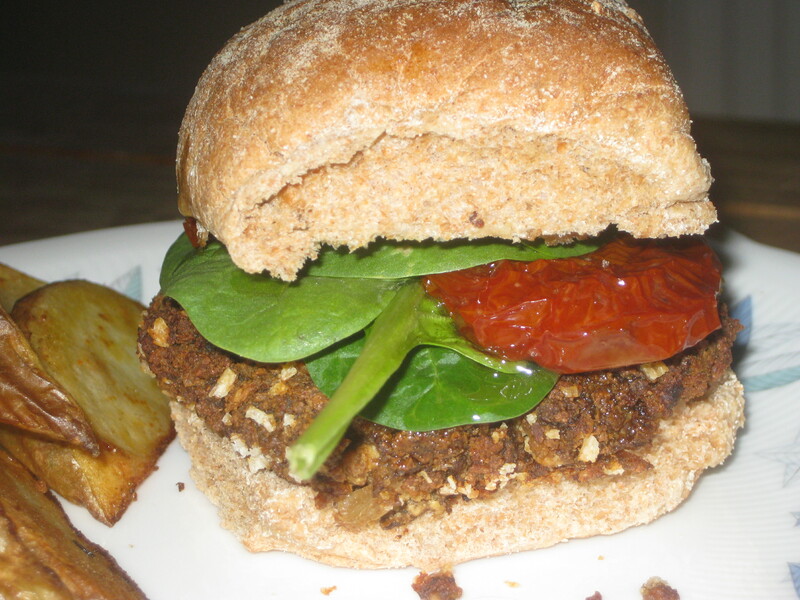 The porcini tofu burgers may be the best tasting burgers I’ve made: they’re formed by blitzing some dried porcini and mashing the crumbs with tofu, panko, and various other delicious things. There are lots of powerful savoury flavours in there. However, the texture didn’t quite work out for me, they were too soft on the inside and crumbled quite easily in cooking. I’m going to play around with them a bit more, because they are simply too good to be forgotten. 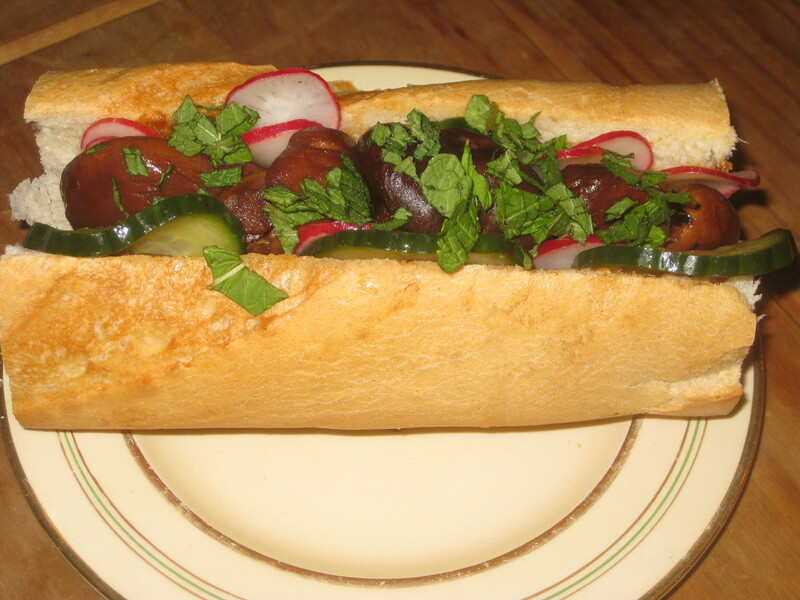 I hate sandwiches, and even I enjoyed this shiitake banh mi. I felt a bit fearful when I was pickling the radishes and cucumber (eating anything pickled is quite adventurous for me) and when I blitzed the almond butter and sriracha for the spread. But when those two elements came together with the meaty shiitakes, the fresh baguette and the fresh herbs, it was a beautiful combination and a lovely light meal. I used the same fillings with seeded brown bread for an exciting addition to my afternoon tea table as well – it was unconventional, but a hit with everyone. I had high hopes for the red lentil thai chilli, and it didn’t disappoint. 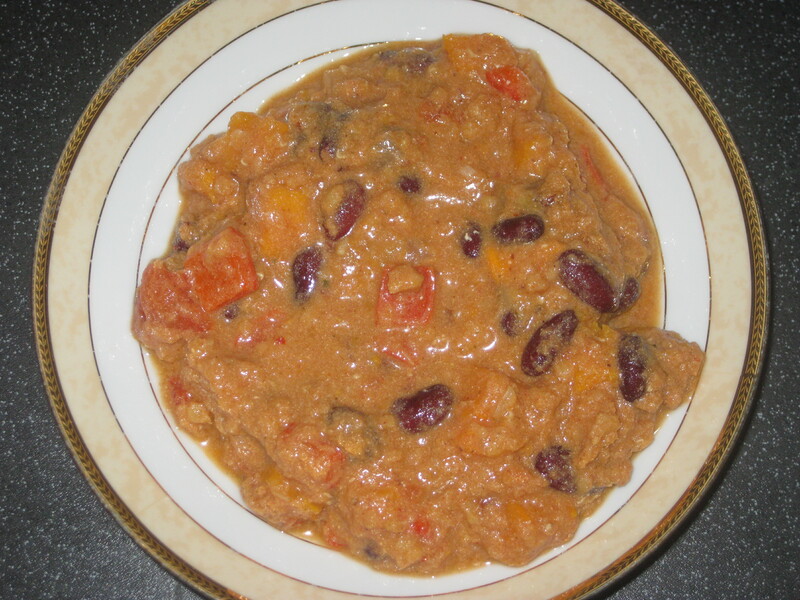 It has red curry paste and coconut milk to lend a taste of South East Asia, but also kidney beans and red lentils in a nod to the usual Mexican chilli ingredients: a very happy combination! The Omaha yakisoba was really easy to make, even on a work night. 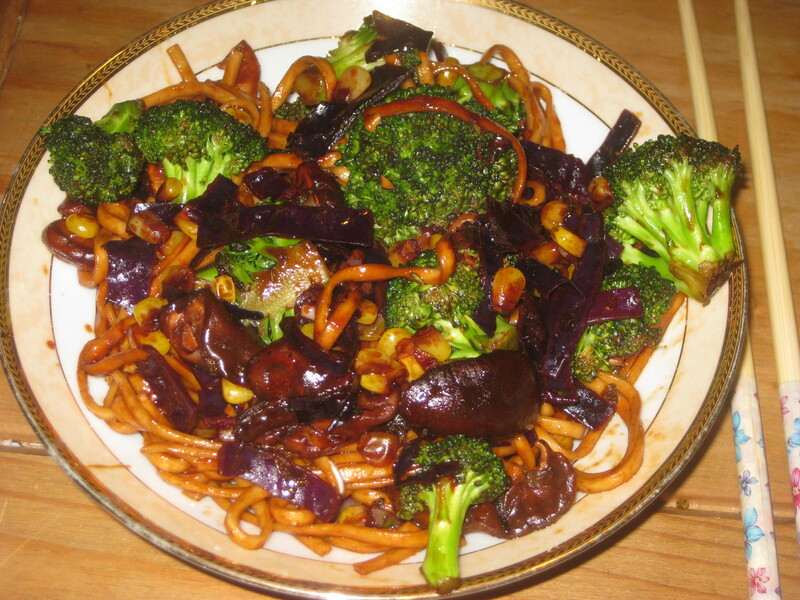 It didn’t take long to throw together, and it was a really tasty and satisfying mix of udon noodles, sweetcorn, shiitakes, red cabbage, broccoli and Asian seasoning. It’s easily adaptable as well to whatever veg you’ve got in – I made it again the next night with asparagus and chestnut mushrooms. As I said in Part One, this book is famous (in my home, at least) for its breakfasts, and while I’ve already tried out quite a few there were still some more to explore. Behold the chipotle sausage hash. The dressing (miso tahini, my new favourite combination) was heavenly, and the potatoes and sausages are obviously a delight. The recipe suggested just two sausages to serve four people. I don’t know what kind of people this is meant to feed, but we had two sausages each and called it a proper meal. It was delicious! The only possible complaint is that it looks so very brown – a handful of wilted spinach leaves next time will sort that out. 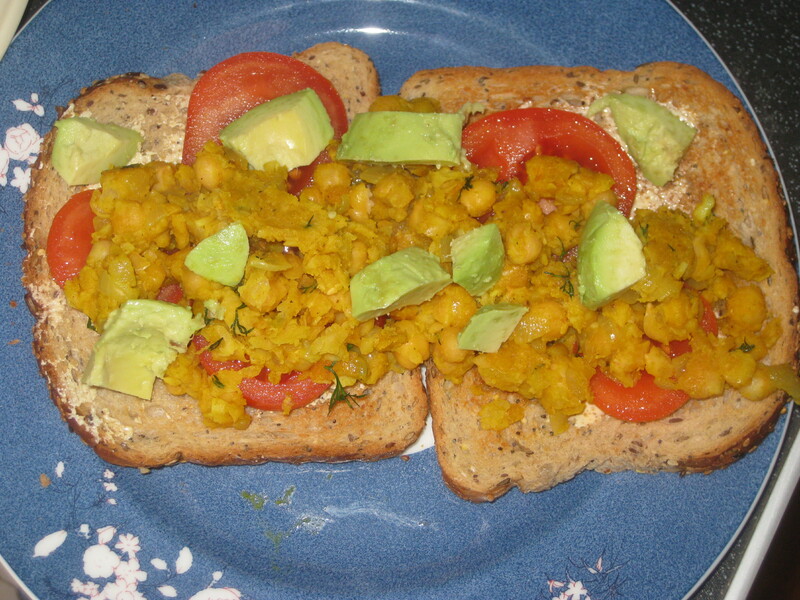 Less sensational, but still tasty, was the scrambled chickpeas. Again, I don’t feel like there was enough to serve four people – you really did need the tomatoes and avocadoes to fill you up. Fortunately, they were a good tasty addition, though I think I might chop the tomatoes and add them to the pan for a few minutes next time. What a fine month it’s been! The recipes are all easy to follow and the results have been uniformly good – the only problem has been the seasoning and spiciness, which I feel need to be significantly increased. Those are the kind of tweaks that are easily made, though, and I think this book is a great addition to the bookshelf. It’s not surprising that Isa is one of the most famous vegan cookbook authors in the world – she presents dishes that are by turns colourful, exotic, comforting and flavoursome, and she makes veganism very accessible. When people ask me in horror, “But what do you eat?” I want to hand them a copy of this book so they can see that my diet is in no way dull and repetitive. Next month I’m being bolder and going for one of the cookbooks I rarely use. In fact, it has only had two outings in about 4 years. Fingers crossed I will discover some hidden gems in Asian Vegan Kitchen! 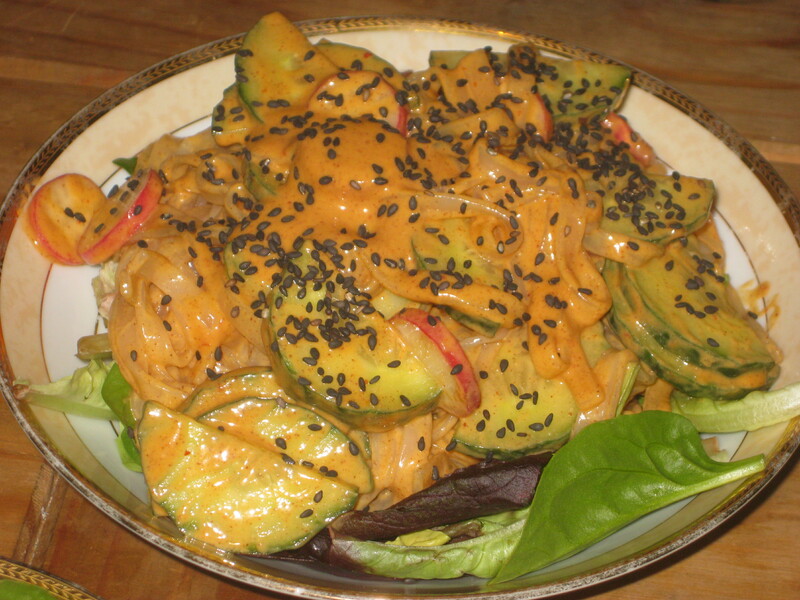 This entry was posted in Cookbooks and tagged Isa Does It cookbook, vegan cookbooks. Bookmark the permalink.